3. The bonds between the atoms are not full double bonds (as this would require two fewer electrons, similar to carbon disulfide), and the molecule can be thought of as a resonance between two states, in each of which one of the end atoms has a negative formal charge while the central atom has a positive formal charge, making it valence isoelectronic to ozone. 3, where the sulfur atoms are arranged in an equilateral triangle with three bonds (similar to cyclic ozone), should in theory be lower in energy than the bent structure actually observed. 3 has an absorption peak of 6993425000000000000♠425 nm with a tail extending into blue light. 2 embedded in a glass or matrix of solid noble gas. 3 radical anion. This is valence isoelectronic with the ozonide ion. The spectrum of the colour shows a strong absorption band at 610–6993620000000000000♠620 nm or 6981331650532809000♠2.07 eV. The blue colour is due to the C2A2 transition to the X2B1 electronic state in the ion. The Raman frequency is 7002523000000000000♠523 cm−1 and another infrared absorption is at 7002580000000000000♠580 cm−1. 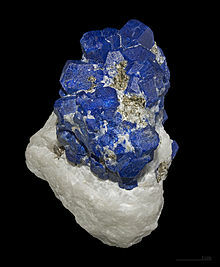 3 ion has been shown to be stable in aqueous solution under pressure of 0.5 GPa (73,000 psi), and is expected to occur naturally at depth in the earth's crust where subduction or high pressure metamorphism occurs. This ion is probably important in movement of copper and gold in hydrothermal fluids. 3 include reacting sulfur with slightly dampened magnesium oxide. 2 which has an optical absorption at 6993390000000000000♠390 nm and Raman band at 7002590000000000000♠590 cm−1. 3 has a bond length in the trisulfide ion of 6990205000000000000♠0.205 nm. The bonds are single. It is isoelectronic to sulfur dichloride. ^ a b Greenwood, Norman N.; Earnshaw, Alan (1997). Chemistry of the Elements (2nd ed.). Butterworth-Heinemann. pp. 645–662. ISBN 978-0-08-037941-8. ^ Michael C. McCarthy; Sven Thorwirth; Carl A. Gottlieb & Patrick Thaddeus (11 March 2004). "The Rotational Spectrum and Geometrical Structure of Thiozone, S3". Journal of the American Chemical Society. 126 (13): 4096–4097. doi:10.1021/ja049645f. PMID 15053585. ^ a b Beate Flemmig; Peter T. Wolczanski & Roald Hoffmann (1 June 2005). "Transition Metal Complexes of Cyclic and Open Ozone and Thiozone" (PDF). Journal of the American Chemical Society. 127 (4): 1278–1285. doi:10.1021/ja044809d. PMID 15669867. ^ Hugo Erdmann (1908). "Ueber Thiozonide, ein Beitrag zur Kenntniss des Schwefels und seiner ringförmigen Verbindungen". Justus Liebigs Annalen der Chemie. 362 (2): 133–173. doi:10.1002/jlac.19083620202. ^ a b c d e f g h Beat Meyer (March 1975). "Elemental Sulfur" (PDF). Chemical Reviews. 76 (3): 367–388. doi:10.1021/cr60301a003. ^ John S. Lewis (2004). Physics and chemistry of the solar system. Academic Press. p. 546. ISBN 9780124467446. ^ John S. Lewis (2004). Physics and chemistry of the solar system. Academic Press. p. 539. ISBN 9780124467446. ^ Steudel, Ralf; Steudel, Yana (November 2, 2004). "The Thermal Decomposition of S2O Forming SO2, S3, S4 and S5O — An ab initio MO Study". ChemInform. 35 (44). doi:10.1002/chin.200444022. ^ Craig E. Manning (25 February 2011). "Sulfur Surprises in Deep Geological Fluids". Science. 331 (6020): 1018–1019. Bibcode:2011Sci...331.1018M. doi:10.1126/science.1202468. PMID 21350156. ^ a b Ralf Steudel (2003). "Cluster Anions Sn− and Sn2−". Elemental sulfur and sulfur-rich compounds, Volume 2. p. 16. ISBN 9783540403784. ^ Gleb S. Pokrovski1 and Leonid S. Dubrovinsky (25 February 2011). "The S3– Ion Is Stable in Geological Fluids at Elevated Temperatures and Pressures". Science. 331 (6020): 1052–1054. Bibcode:2011Sci...331.1052P. doi:10.1126/science.1199911. PMID 21350173. ^ Tristram Chivers; Ian Manners (2009). Inorganic rings and polymers of the p-block elements: from fundamentals to applications. Royal Society of Chemistry. pp. 295–296. ISBN 9781847559067. ^ T. Chivers, I. Drummond; Drummond (October 1972). "Characterization of the trisulfur radical anion S3− in blue solutions of alkali polysulfides in hexamethylphosphoramide". Inorganic Chemistry. 11 (11): 2525–2527. doi:10.1021/ic50116a047. ^ a b Richard R. Hark & Robin J. H. Clark. "Raman Microscopy of Diverse Samples of Lapis Lazuli at Multiple Excitation Wavelengths" (PDF). Archived from the original (PDF) on 2011-07-26. This page was last edited on 18 December 2018, at 00:30 (UTC).